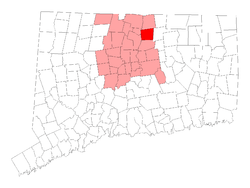 Made up of the villages of Broad Brook, Melrose, Scantic, Warehouse Point and Windsorville, East Windsor is a town in northern Hartford County, Connecticut. Home to the Connecticut Trolley Museum and the Connecticut Fire Museum, East Windsor is only a short 20 miles northeast from our West Hartford office, and is easily accessible to our locations in North Windham and Unionville as well. If you've got kids in East Windsor, CT, take care of their teeth right by taking them to the expert team at CT Pediatric Dentistry!